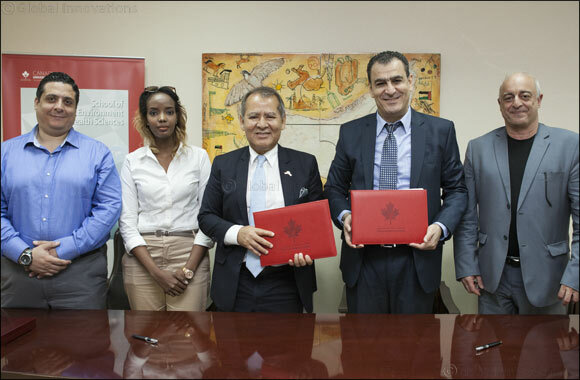 Dubai, UAE, May 31, 2016: Canadian University Dubai (CUD) is set to build upon its pioneering work in environmental development and the green economy through a new partnership with sustainable solutions experts, Provectus Middle East. The collaboration will now build upon a number of existing synergies between the two organizations. Provectus Middle East is leading a national campaign for the ethical disposal of used cooking oils and food waste recycling, while CUD's School of Environment and Health Sciences has established the UAE's first associate degree program in food safety. Furthermore, CUD has been recognized for its efforts in the field of energy management, with a conservation award from the Dubai Electricity and Water Authority. Meanwhile, Provectus is leading the way in initiatives such as hazardous aerosol cans recycling, water treatment (ammonia removal and deinonization), energy storage systems (replacing petroleum gensets to reducing carbon footprints), energy efficiency solutions for AC and AC Chillers, and sustainability courses endorsed by IEMA, including the carbon footprint practitioner, CSR practitioner, and GRI reporting. The agreement is set in the context of the UAE national strategy to create 160,000 ‘green collar' jobs in the renewable energy sector by 2030. The partnership will result in a portfolio of education, training and professional development programs that will help in the growth of this human capital.